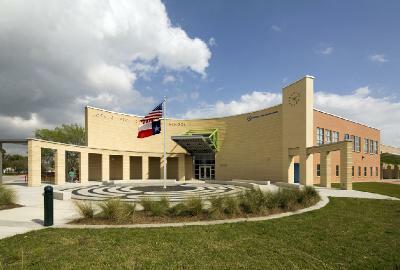 Public functions, such as cafeteria, gymnasium and multi-purpose room buffer the classroom pods from the busy thoroughfare and new metro rail line for this 90,000 square foot replacement school.The spatial composition is dominated by two cylindrical forms, one exterior and the other interior, which symbolically represent, the community of the neighborhood (exterior), or the community of the school (interior). The exterior cylindrical form which marks the corner of the site serves as an entrance court. The other is the library, or ‘heart’ of the school. Materials and colors evoke the spirit of the schools it replaces.